The concept is simple but unique, put together a number of tracks from various artists showcasing influential and potent drummers. This was the concept for Magna Carta's first drum nation CD, and they continue it here - why mess up a good thing? This one features performances by drummers as diverse as Mike Portnoy, Pat Mastelotto, Dennis Chambers and even Anton Fig (yes, the guy who goes virtually unnoticed in David Letterman's band). 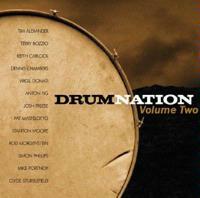 The result is a nice collection of material covering a wide range of sounds and drumming styles. I usually don't comment a lot on packaging, but I have to bring to notice Dan Hanley's cool renderings of the various drummers in the booklet that accompanies the disc. He has done a nice job of capturing both the likenesses of these men, but also the feel of the art that used to be presented on old jazz albums - bravo Dan! The songs are credited in the track listing not to the original artist, but to the drummer who is featured on the recording. Since I previously covered many of these on their original releases, I have included those write-ups (or reworkings of them in some cases) in the track by tracks in the interest of consistency. 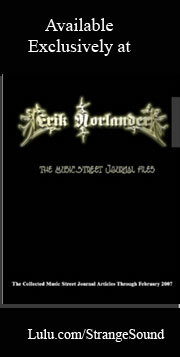 This review is available in book format (hardcover and paperback) in Music Street Journal: 2005 Year Book Volume 3 at lulu.com/strangesound. This one comes in slower and heavy, again feeling a bit like DT, but as the instrumental themes begin to emerge, fusion characteristics enter, bringing in a slight eastern tinge with them. The cut alternates between various modes, and includes a fairly frantic, bass heavy segment that has the keys nearly screaming out. Then an interesting rhythmic structure emerges and the piece goes into a wholehearted fusion excursion. It gets rather noisy and chaotic later, with more metallic tones emerging before shifting towards something a bit more melodic. This is a very dynamic number, but sometimes test the limits of melody. An enigmatic and mysterious sounding intro leads to a piece that contains a hard-edged fusion texture throughout much of the work. The lineup on this track is the Gardner brothers, Pat Mastelotto, Peter Banks and Matt Guillory. This is quite dramatic. The piece is a powerful and dynamic prog instrumental that covers a lot of musical ground. Starting with mellow piano, this builds quite slowly on that basis for a while. As it carries on the piano takes on various melodies wandering between the frantic and the sedate, the jazzy and classically dominated. After a time the bass comes in in a pattern that calls to mind the riffs of Chris Squire, and the group are off on an uptempo prog rock excursion. Sheehan's work is a definite standout and a must-have for bassist and bass fans. Chambers shows off his chops on the skins here, also. Meaty bass lines begin this. As it carries on some very traditional prog moments emerge in the instrumental interplay, feeling at times a bit like Bozzio's old band UK. The bass work on this one is very musical, truly taking the lead for a while. It drops to more sparse arrangement at times. It is one that shows leanings toward the sounds of King Crimson. The vocals only show up as spoken words barely heard. Percussion starts this smooth jam that is just good mid-tempoed fun with a jazz flavor. This Parliament cover has some Hawkish moments in the overlayers, and the guitar gets a rather crunchy as the cut intensifies. This fun, groove-oriented track is a solid prog piece with very entertaining textures. The bass in on this one feels quite Levinish. The guitar enters in a quirky, yet catchy riff. This jam is quite awesome. This one rocks in very funky. It's a deftly punctuated fast paced odd cut that wanders in a good many direction while always managing to move back to it's main funky groove. This appropriately features some killer percussion later. An odd sort of jazz sound is the basis for this unusual composition. It feels almost normal, but still with a strange sonic texture. This feels rather Zappaish. A great playful groove emerges later. Performed by Robert Berry, Simon Phillips and Igor Khoroshev, this hard rocking ELP progger is carried off remarkably well. Khoroshev`s work on this number is nothing short of brilliant, and shows that this man certainly has a promising career ahead of him. He will certainly stand beside the keyboard greats of the `70`s very soon. This is the strongest cut on the disc, and is a wonderfully powerful instrumental journey with incredible musicianship shown by all three men. This comes in rather dark and tentative. Noisy creepy sounds come over top, and it begins to grow into a Crimsonian piece of weird cacophony. This extended instrumental is very dynamic and diverse. Percussion appropriately starts this killer funky jam. This smoker is definitely a highlight of the disc. It has a cool segment where it feels like the guitar is talking. Percussion starts this Sly and the Family Stone cover, and the bass comes in appropriately funky. The band turns in a very potent funk rock jam that grooves quite well. This instrumental is one of the best the band has turned in and features some killer instrumental work.